Ever see what a mahi mahi looks like? As in the actual fish? I sure as heck hadn't, and since I have a sick sense of humor in which I like to put a face to whatever animal I'm currently eating (sorry, vegans), I Google image searched one the other night while standing out by my grill and came across this. Um, wow. Like, I'm not sure what I exactly expected a mahi mahi to look like, but it wasn't quite that. Big ol' paint dropcloth looking thing. Um...yumm? 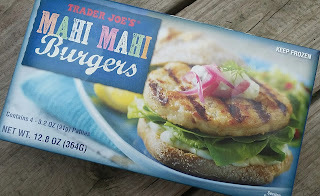 There's many fine and wonderful and fancy ways to enjoy a good slab of mahi mahi, but for a quick, easy, and convenient preparation, it may be hard to be beat Trader Joe's Mahi Mahi Burgers. These frozen fish pucks are yet another example what draws me to TJ's seafood products - it's overall fresh and clean vibe. So many other frozen seafood I've had is salty or mushy or overly fishy or just off. But nope, not here. The fish itself has a very mild, clean flavor, with a couple spices like paprika and rosemary put on for a little character, but there's not much standing in the way of the actual fish flavor. One thing both Sandy and I particularly liked: these actually really hit the "burger button." 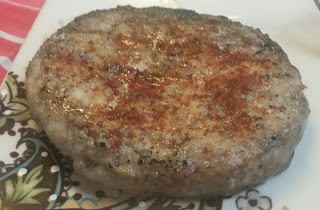 The texture and mouthfeel approximate that of a regular beef or turkey burger - a little softer, yes, but as close as a fish can get to a burger, these do. We're impressed. And even our kiddos love them - our just-turned-four year old M grins with delight every time we tell her fish burgers our on the menu. Put anything on these burgers you like - we particularly enjoyed some salsa or slaw or (as pictured) the chile lime powder. It's light, good eating. The box of four runs about $6, which isn't awful for some decent quality fish, and as a pro tip, they even reheat well without stinking up the joint (so says Sandy, I'd be too chicken to try that). Great summer time pick up to toss something a little different on the grill, so we're going with some high marks here. I took awful pics of the nutritional stats so see them here. I throw these in a skillet and cut them up for some protein on a salad! Yum! That's what I've been doing, too. Or I throw beans and onions and spinach into the skillet near the end of the cooking time. I'm not a big fan of fish specifically fish that are fishy tasting. Are these really fishy tasting or more like Cod or Pollock? We have these burgers pretty often. We like them with a slice of TJ's Havarti cheese, sliced avocado (or TJ's guacamole), and sliced red onion. Delicious! After seeing that you gave them an 8.5 and reading these comments, I bought a package. I didn't cook them for a couple of weeks as I was really nervous about them being fishy. Had them tonight and they're AMAZING! I'm so glad I read your dependable review and the comments. Finally, a delicious "fish burger". Look up Wolf Fish...........Fortunately I ate some of this delicious fish before seeing the picture! Made fish tacos with these, love them.